Disclosure: I received a complementary copy of Despicable Me 3. No other compensation was received. Any and all thoughts are honest, my own and may vary from yours. Illumination and Universal Pictures Home Entertainment present Despicable Me 3 now out on Digital, 4K Ultra HD, Blu-ray™, DVD and On Demand. 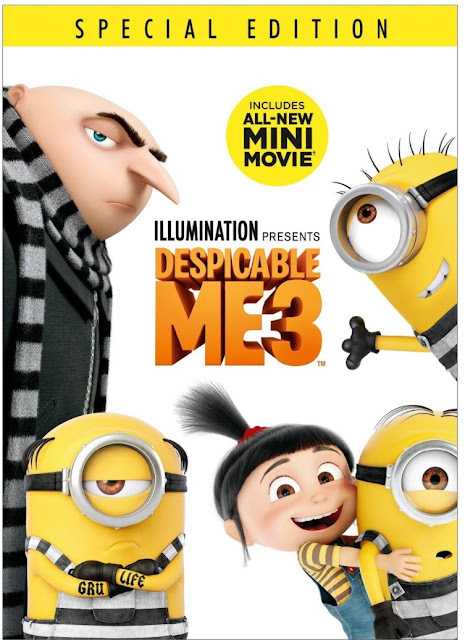 The characters beloved by everyone – Gru, his wife Lucy, their three adorable daughters—Margo, Edith and Agnes—and the Minions provide hours of family fun in this heartwarmingly subversive comedy. Despicable Me 3 is the ultimate holiday gift, with almost an entire hour of exclusive bonus features including an all-new mini-movie, a never-before-released deleted scene, and much more!